Call Lyndsey on 07969 161 941 or email ldbeauty@btinternet.com for all booking and gift voucher enquiries. For all recent offers, updates, products in our sale and photographs please visit our facebook pages. This year we will be making special Christmas Pamper Hampers, tailor made specific to your needs and price range so why not spoil special someone this year. Give us an idea of what you would like and we will sort the rest. Skincare products, nail polish, aromatherapy candles, makeup, Miller & Hunt jewellery and gift vouchers can be included in the hampers too. Just drop us a message for that perfect stress free Christmas. Please not these DO have to be ordered in advance. We currently have a massive clearance sale on all our Eve Taylor skincare and Jane Iredale mineral makeup. All Jane Iredale £22.00 and under. Sorry for the lack of posts on here it has been a very very busy year. Christmas is booking up fast this year, so please book in advance to avoid disappointment. Gift vouchers are also available for that special gift this Christmas, along with beautiful natural products, why not ask up to put together a special pamper hamper for that special someone. 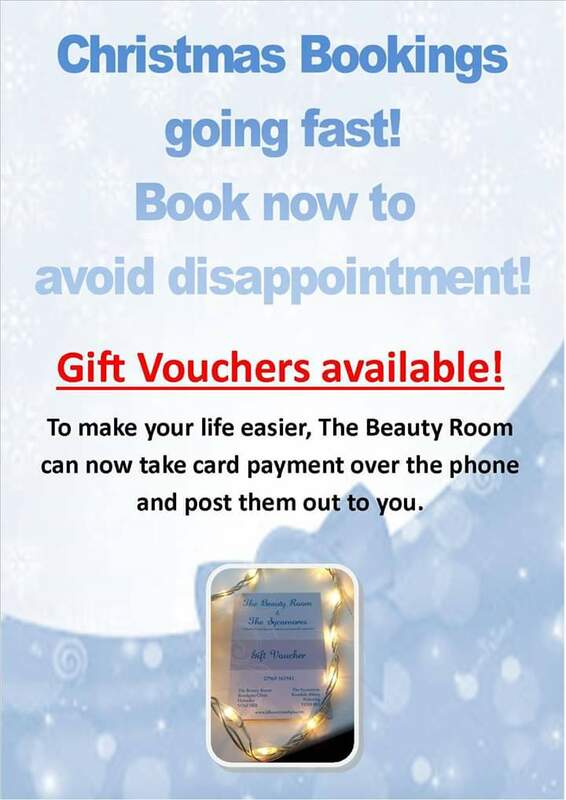 Gift Vouchers are available for both The Beauty Room Helmsley and The Sycamores Rosedale. We can also now take payment by card over the phone and post them out to you to make your life a little easier. Offer 1: - Deluxe fine gold & champagne anti-ageing body wrap. The Champagne extract is naturally rich in active ingredients for benefiting the skin. The extract combines fruit acids (AHA) known for helping skin cell renewal. This pure indulgent, velvety rich wrap leaves a light gold shimmer on the skin. Perfect for the party season. Whilst the active ingredients work their magic receive a complimentary golden facial polish. A Christmas special one off not to be missed. Available at The Sycamores Rosedale ONLY!! Limited availability! Embrace the festive season with this limited addition Christmas scrub, infused with the heady aromatics of mulled wine. Creates a luxurious and intense body treatment, perfect for exfoliating dead skin cells, smoothing and moisturising the skin and stimulating circulation. Whilst wrapped in warm blankets for the oils to penetrate the skin, receive a complimentary cranberry facial polish.